Last night I went along to TeachMeet Glasgow. Why unplugged? We want everyone to be prepared with something to share. And not to worry too much about the tech and their PPT slides. However, clearly with a better balance of men, women and youth! We may be talking about ‘the tech’ but can we challenge ourselves not to hide in front of our PPT slides, tablets and media? The face to face interaction bit is crucial. Also, we need more people to take up the mantle of organising informal teacher events, whether they be TeachMeets, Pedagoos or something else. These can be in pubs, coffee shops, schools or someone’s living room. I’m not sure the example of large chat show style events with TV production values are really within everyone’s grasp. But that’s just my opinion. There really are no rules. As Radio Edutalk was busy I borrowed the #DS106 Radio airwaves to broadcast live. Seemed to get a few listeners. I’ve not tried to do anything with the audio as the piano and bar buzz was quite loud. 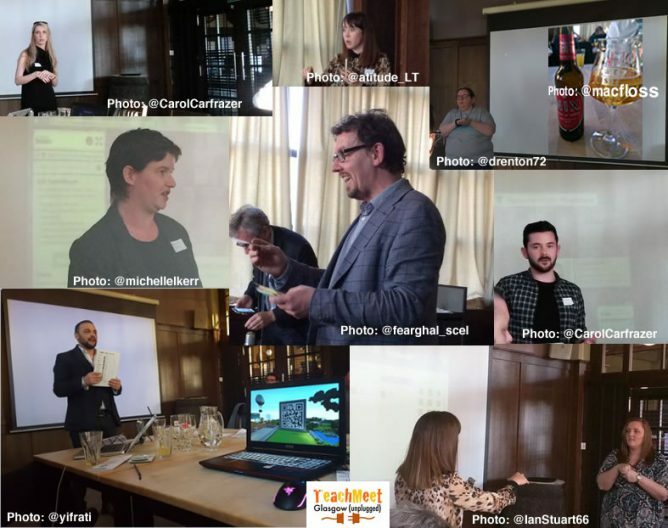 I made a quick #tmglasgow (with images, tweets) Storify that doesn’t give a complete picture (I removed the swimsuit girls that hopped onto the hashtag). As was pointed out at the meet, I am old enough to have been at the first TM (grey headed even then). I’ve disliked some of the directions that TM has gone, this one felt that it was on a great path. There was a quite a few folk I’ve met at TMs over the years but there were many I had not. A lot of these ‘newcommers’ brought a buzz of younger energy in the room. Athole managed not only to unplug TM but to give it a bit of a reboot too.